He also admits the outcome in Bedfordshire on Saturday will shape the rest of Park’s season as a defeat could all but end their promotion ambitions. As things stand, Ampthill sit at the summit of the division while third-placed Park are six points behind the league leaders with four matches in the season remaining. Occupying second position in the table are Old Elthamians, who are five points off the top, but this weekend’s clash between Ampthill and Rosslyn Park will have an impact on the rest of the title race. Asked whether their eagerly anticipated match with Ampthill would define Rosslyn Park’s campaign, Doran-Jones said: “I think it will. We don’t want to go and heap a load of pressure on ourselves, but just by the nature of it, I think it is a game which can dictate who comes in and who comes out. After finishing in 12th place last season, Park have certainly made positive strides this term as they have consistently found themselves involved in the promotion conversation. This is Park’s best title challenge since 2014/15 and Doran-Jones believes the reason for their positive season has been the ability to adapt to certain situations. However, he does concede they have missed chances at times this season and highlights a home fixture with bottom of the table Esher back in November and both matches with Darlington Mowden Park as games which got away from Park. He added: “We have had opportunities where we have dropped points where perhaps we shouldn’t off. Esher at home and we also had two tightly contested fixtures against Darlington Mowden Park where they were almost identical, high scoring fixtures and we narrowly lost them both. “If we had converted those games, we would have run away with it but you can’t jog backwards. We are where we are and we have grown a lot as a team. “We have also learnt a lot in terms of game management and how we need to play in certain circumstances because something that was really glaring for me when I turned up was our desire to absolutely play no matter what the conditions were! “We just wanted to ‘have a go’ and that is great, but at the same time, you have got to have some element of pragmatism. Doran-Jones is now very much part of the set-up at Rosslyn Park after joining the National One outfit last summer. The former Gloucester, Northampton Saints and Wasps man didn’t have any plans to play a full season in the third tier, but admits he has enjoyed every minute. “I had sort of retired as a professional after Wasps at the end of last season and I also live in the area,” he added.“My wife basically pointed the finger at me and said she could see a gut developing underneath the shirt! “In seriousness, I was missing the whole camaraderie of the lads. I think a lot of players miss that when they transition out of professional rugby or professional sport and I was struggling without it. “My mates Jordan Turner-Hall and Jon Mills were obviously coaching at Rosslyn Park and I asked them if I could come down and have a run around in pre-season just to try and stay fit. 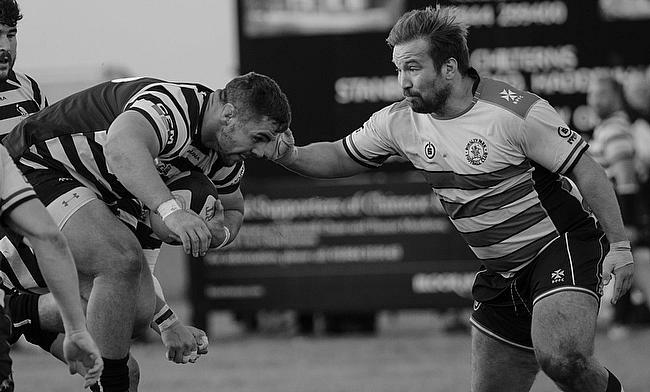 Since pulling the boots back on at Rosslyn Park, Doran-Jones has also taken satisfaction from passing on advice to some of the younger members of the squad and believes the National Leagues can massively help with player development. “What has been great from my point of you is that we do have a couple of young front-rowers like Ali Wade and Maurice Nwakor in our ranks who are really decent little players and they are craving a little bit of guidance,” said the ex-England international. “I’m not necessarily mentoring them because I am playing alongside them, but I’m just trying to point them in the right direction.They have developed an awful lot and we have all developed as a group. “They are top lads that really, really graft. They are not academy products. They are not perhaps spoilt by that side of things.
.@CJMulchrone could not speak highly enough of the National Leagues because they played an integral part in his journey to the Premiership. “They are just really raw and have not had a traditional way through. They have had to graft their socks off to get to where they are and I really identify with that. Now, Doran-Jones and his side will be purely focused on Ampthill this weekend. Park beat the A’s 10-6 back in December and even though there are limited games remaining in the season, the prop does feel anything can happen in the final month of the term. He added: “From my personal point of view, that Ampthill game was probably the toughest fixture I have played in the league this year. It really went up a level. It was hammering down with rain and it was a bit of bruiser! “I think it will be a bit of a different game because it will hopefully be sunny and hopefully we can showcase a bit more attacking rugby. I am really looking forward to it.